I’ve been thinking a lot lately about Notre Dame (officially known as Notre Dame de Paris, but also commonly called Notre Dame cathedral). There are many beautiful churches in Paris, and I may even be persuaded to admit that Sainte Chapelle and Saint Eustache are more grand and glorious, but nothing beats Notre Dame’s position along the Seine on the gorgeous Ile de la Cite. And, despite being completely non-religious, attending Christmas mass at the cathedral in 2012 was a very special experience for me. From the gargoyles to the massive stained-glass windows to the iconic towers and flying buttresses, Notre Dame is a sheer delight. And here are some tidbits about the church. Construction began in 1163 and wasn’t completed until 1345. The church was constructed specifically to hold three of the most important Catholic relics — Jesus’s crown of thorns, a piece of the True Cross and one of the Holy Nails used to nail Jesus to the cross. Following the French Revolution, the church was used as a food-storage facility and quickly fell into ruin. It became so delapidated in the early 1830s that city planners began to discuss tearing it down. When Napoleon was crowned emperor in 1804, there were even fears part of the church would collapse on Napoleon, his wife and the Pope, who traveled from Rome for the coronation. 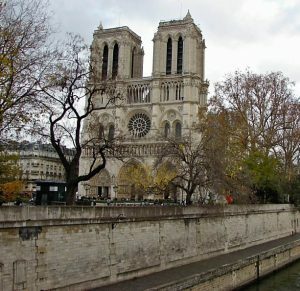 It wasn’t until the release of Victor Hugo’s novel “The Hunchback of Notre Dame” in 1831 that Parisians warmed to the idea of renovating the massive church, and a huge restoration project was finally launched in 1845. And on Aug. 26, 1944, a celebratory mass was held in the cathedral to celebrate the liberation of Paris from the Nazis. That mass was interrupted several times by Nazi snipers who were still ensconced in the church’s bell towers. This entry was posted in Churches, Notre Dame and tagged Churches, iconic landmarks, Ile de la Cite, Notre Dame by Bob Adams. Bookmark the permalink.